According to Brad Wiskirchen’s 12-year-old son, dad’s job is to catch bad guys on the internet. “What we really do is give companies the data they need to make sure they’re dealing with a verified person during digital interactions,” said Brad, the CEO of Kount. 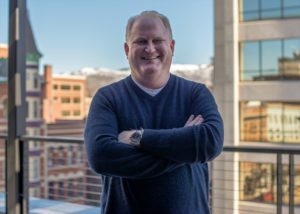 The patented technology Kount uses was originally developed at another Idaho-based powerhouse, ClickBank, where Brad previously served as CEO. Now, Kount’s award-winning fraud management, identity verification and online authentication technology empowers digital businesses, online merchants and payment service providers to make better business decisions through data. One might think that Brad’s primary source of pride comes from protecting large industry names such as Staples, Dunkin’, BodyBuilding.com, BP, PetSmart, Intuit, and Wendy’s, just to name a few. But what he’s most proud of is the family environment Kount’s maintained throughout its pattern of continued growth. Brad emphasizes that while most people will undoubtedly rally behind a morally compelling value proposition, the true test of a company is how much the employees care about each other. Brad understands that the bonds developed beyond the office walls helps enable his employees to be hyper-effective. That’s part of the reason the company focuses on opportunities to give back through community service projects with organizations like Habitat for Humanity, the Idaho Foodbank and various cleanup programs. The Kount team, cultivated from that remarkable community, is comprised of quality employees dedicated to long term careers. Their relationships with their coworkers and community enable them to perform better than anyone else in the industry. Kount is located at 1005 W Main St, Boise, Idaho, 83702 or at www.kount.com.